Looking stunning and the case fan are very quite. I can't say enough good things about this case....but I'll try. It's kinda like the TARDIS - bigger on the inside than on the outside. The cooling options are insane for a mid-tower, and the cable management is a dream, unfortunately I can't enjoy that part due to my PSU's 400 feet of cabling. I love the fact that all of the hard drive bays can be moved around, spun, or removed altogether, which is what I eventually did as I have no HDD installed. There are two SSD mounts behind the motherboard tray where my OCZ and Crucial live. There is plenty of sound dampening material inside and the door can mount on the left or right. I only mounted one optical drive and left the insert cover in place because I won't be using it much. If I had to be picky I would wish the case came with rear dust filters, but it does have removable front and bottom filters. I ordered some magnetic filters for the back, and if I ever add more radiators for the top I will have to add filters for that. So far the case if very, very quiet. There are 8 fans in the system, the loudest being on the PowerColor Devil video card and its radiator. -A ton of cable management options, with included velcro straps and generous grommets throughout. -All cables are clearly labeled for mobo connection, and the manual can get you through any problems you encounter. -Removable drive cages allow you to keep what you need where you want it, and not have the rest taking up space. -Matte white paint job is excellent. -The front panel, and forward moduvent can be difficult to pop off. -The front panel dust filter was rubbing on my 140mm Noctua fans, so I had to remove it. 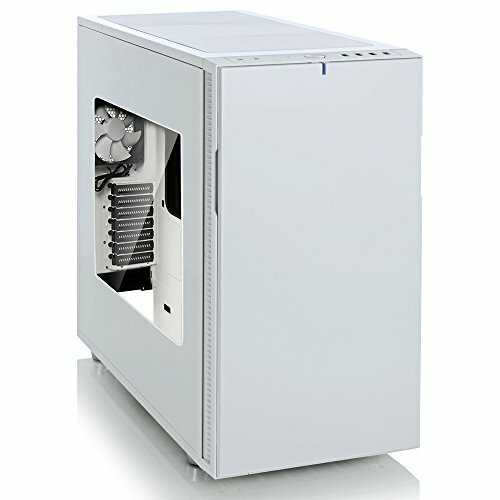 -Be aware that with a 280mm radiator on top, you wont be able to fit a 140mm fan on the back panel unless you remove the optical drive bay. -You may need a 120 and 140mm fan on bottom(instead of two 140's), depending on how big your PSU is, as the cables coming off the PSU may prevent a 140mm fan. -I wish they offered this case(White w/ window) with a brushed metal front door. This was probably one of the hardest decisions of the build. I knew I wanted a black and white theme but I was torn between this one and the NZXT H440. I eventually decided on this one because it had more of a minimalist look that I really wanted. A breeze to build in. It comes with cable straps on the back so please don't go out and buy cable ties like I did. And the sound dampening foam is a big bonus. Love this case. It's so quiet with the noise dampening panels. CONS If mounting a watercooler rad on the top, you will likely have issues with space. I originally had planned to have the Kraken x61 radiator mounted towards the back but it was too thick and would not clear the top of the motherboard. Granted I have the "TUF Shield" which covers the I/O components of the motherboard but those two did not play well together. It's been almost 5 years since I last ripped open a PC to make changes and this was just a breeze to work with. Ample space and incredibly easy to manage cables (although I have done a shoddy job of this at present). As others have noted, it might be a tight fit to get a 280mm radiator up top and the lack of a filter where the ModuVent system is does let the case down a little, but overall well recommended. Really easy to work with as a first build. Nice style. This case is beautiful, and tons of rearrangement on the inside with the bays. The window gives you a perfect view of your setup inside. I really enjoyed building in this case. The hard drive bays are fully removable, allowing for more space and air flow. I also like the minimalist look on the outside. It also has decent soundproofing, hiding a lot of the noise coming from some of the fans I bought. Beautiful case for my minimalistic friends out there. Sleek and very VERY easy to work with.